Governor of the British Virgin Islands, His Excellency Mr. John S. Duncan, OBE continues his tour of the sister islands with a visit to Jost Van Dyke. The visits are in keeping with his promise to visit various parts of the Territory early in his time in office. Earlier this month, Governor Duncan accompanied by his family and Sister Islands Coordinator, Mr. Vincent Wheatley visited Virgin Gorda where he met with residents and public officers in the Virgin Gorda Administration Complex. The Governor and his party also toured key sites including the Catholic Community Center, top of the Baths, the Copper Mine, and the Virgin Gorda Police Station. On his way to Jost Van Dyke, Governor Duncan visited the Salt Pond and Salt Island, where he viewed the burial site of persons who lost their lives on the Royal Mail Ship HMS Rhone during the hurricane on November 29th 1867. At Jost Van Dyke, the touring party spent some time at the Primary and pre-primary schools, the Clinic, Government Buildings, the Guava Berry Farm and the Tourist Board’s Visitors Centre. 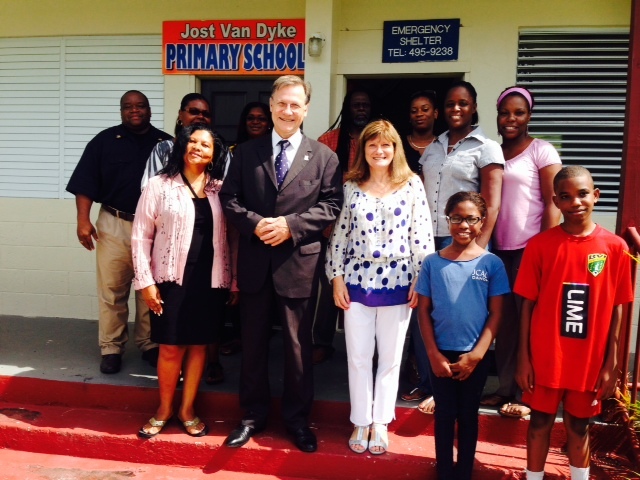 Community members and the Jost Van Dyke Preservation Society also met with Governor Duncan. In his remarks at his Swearing-in Ceremony as the Territory’s 16th Governor on August 15th Governor Duncan shared his objective for visiting various parts of the Territory while in office. “I very much look forward to visiting all parts of the Virgin Islands, meeting you all in person, learning your perspectives on how together we can work in partnership to meet the challenges the Virgin Islands will face and help the Virgin Islands people seize the opportunities ahead.” He said at the time. The island of Anegada is next on the schedule when the Governor resumes his visits to the sister islands in the near future.